Do you want a rewarding career as an Electrician? Electricians are responsible for the safe installation and maintenance of electrical wiring. Electricians are one of the first trades to work on a new building and one of the last trades needed to complete the job. From lighting your way to installing the outlets that provide power to your life, Electricians are needed! Florida Electrical Apprenticeship & Training (FEAT) provides students with a comprehensive education, designed to ensure success in the Electrical Profession. 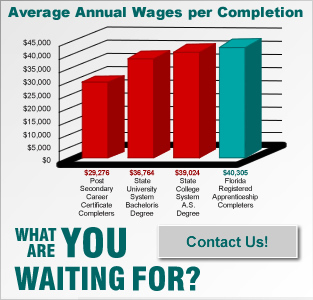 Apprentices are registered with the Department of Labor and the Florida Department of Education. Learn more about this great career! If you register for classes at Orange Technical College Westside Campus in Winter Garden, you will attend the first five classes there. The last three semesters, you will attend classes at Seminole State College or the FEAT office at Orange Technical College Mid Florida Campus in Orlando.